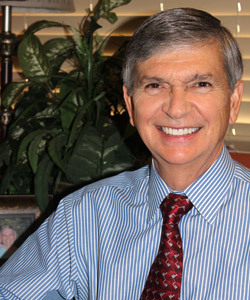 I began my dental career in 1972 and have been happy to provide the best in dental care for over 45 years. Beside the satisfaction I gain in helping people with their dental needs, practicing dentistry in the League City and Clear Lake area gives me the opportunity to meet and get to know interesting people from all over the world. In our office, I have the privilege of working with a group of caring people, and together we have the honor of serving a large family of patients. I graduated with a Doctorate of Dental Surgery (DDS) degree from the University of Texas Dental Branch in Houston, but my education did not stop there. I am involved in continuing education in various forms, from annual meetings of the American Academy of Craniofacial Pain and the International Association for Orthodontics to seminars and classes on cosmetic and restorative dentistry. Continuing education is more important today than ever before. Dentistry advances at a rapid rate, and I am committed to keeping current. The result is better, more efficient, comfortable treatment options for my patients. My wife, Diane, and I have three adult children: Dana, Jeremy, and Marissa, and five beautiful grandchildren. Diane and I enjoy spending time with our grandchildren, traveling, and being involved in our church and community.